In the process of considering an applicant, your organization may create or use documents about an applicant that are not appropriate for that applicant to see. For example, a draft offer letter, meeting minutes, notes about final recommendations, or other documents produced at the institution or received from outside sources. 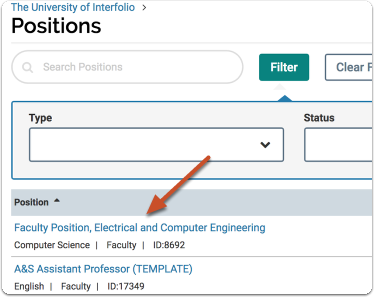 In Faculty Search, administrators and committee members can add internal documents to an individual application that can only be viewed by other administrators, committee managers, and search committee members who have access to view the application materials. 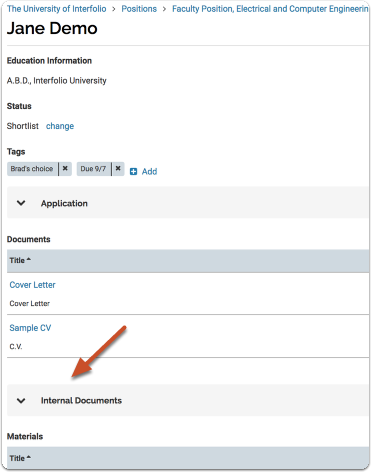 Applicant's cannot view or access internal documents. 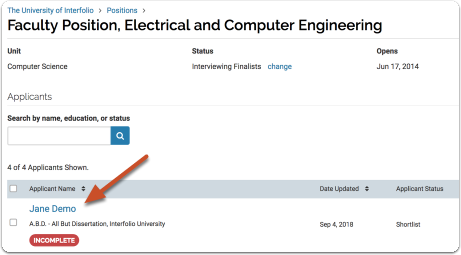 This feature allows committees and administrative staff to share information and materials pertaining to an individual application that should not be shared with the applicant themselves. 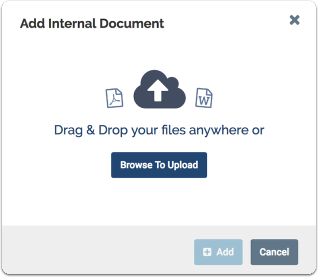 This article explains how to add internal documents to an application. Note: Letters of recommendation requested by the committee will also appear under the "Internal Documents" section of the application. See here for more information on how to Request a Letter of Recommendation on Behalf of an Applicant. For more information see this article on how to Request a Letter of Recommendation on Behalf of an Applicant.